Tenant safety and comfort of living, are most important. Added value of operating smart developments is what renters and owners want. Additionally, it lowers your cost when dealing with critical situations and provides a valuable marketing tool. Avoid serious damages and ensure guests comfort and experience. When something needs fixing, streamline this entire process with Squawk platform. Get notified when something critical is happening within your home or rental properties. If you can’t be reached, let us tell someone you trust. Squawk will help you take action to prevent damages and fix it. Squawk integrates with [any]things — by remaining hardware agnostic, Squawk evolves as technologies do, providing the best fit for all users, regardless of what their favourite IoT devices are. Squawk is an open platform and integrates with all of the best hardware in the market. Our homes provide valuable Behavioural and Diagnostic data. Squawk tells you what you need to know, in order to prevent critical emergencies from happening, and boosting overall health of your living space. When all critical components to your home a working together, know it! And when something changes be the first to know. This is smart security. If something goes wrong, be the first to know. Mitigating damages, will save your properties large and costly expenses. Push Notifications aren’t enough. Set up a trusted contact list, so no emergency goes unanswered. If its time to fix the damage that occurred. Provide clear communication to service people, and keep in other in the loop on progress. Benefit from Squawk by knowing their customers are taking care of their #1 investment, and if any claim is initiated, providing up-to-date notifications to their customers every step of the way. Making the “fixing” process seamless, and ensuring that a negative process for customers, can be an easy experience. By deploying a co-branded version of the Squawk app, your customers will get a powerful connected home experience from a brand they already trust. 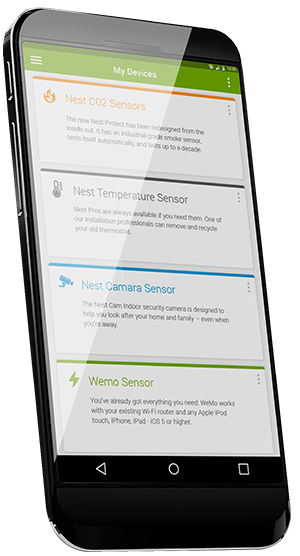 Squawk is smart communication for our homes. IoT home products are growing at an extremely fast pace, and we are providing a communication backbone for this industry. Our focus is on the home (or anywhere people stay and live). This market is currently fragmented, and Squawk is here to provide a seamless experience, regardless of which “things” are being connected. Data aggregation is the key to ensuring our homes are functioning at a level in line with the technologies we use. Did you know? Squawk™ was recognized by Forrester and Gartner!